← Lawn chair ballooning lives on! 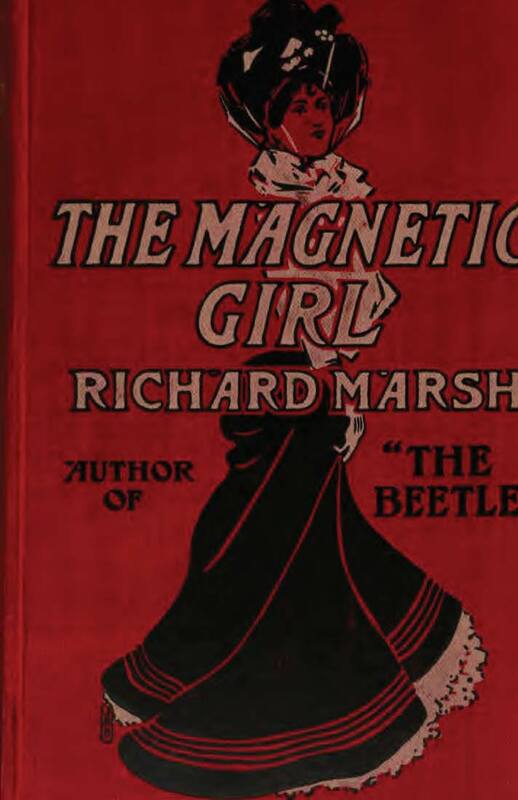 I thought I’d do a post on one more book by Richard Marsh that I’ve read, The Magnetic Girl (1903), currently only available on Google books. In short, The Magnetic Girl is Marsh’s quirky take on the story of Cinderella. Tomboyish and somewhat plain Miss Norah, the narrator of the story, has always lived in the shadow of her lovelier sisters Lilian, Doris, Audrey, and Eveleen, and is constantly talked-down to by them and their mother. As the story begins, Norah has had a particularly bad day, and when she receives her first proposal of marriage from the kind but not particularly handsome Benjamin Morgan, she says some awful things to him. No sooner does Norah make her wish when words begin to appear on a piece of paper on the dressing table: “Your wish will be gratified u—“. The sentence is, at first, incomplete, but will be filled in by the end of the story. Norah goes out on errands for her family, and it slowly dawns on her that she had been granted an exceptional power: every man who sees her falls immediately and madly in love with her! At first she is rather appalled by this newfound ability, but she quickly realizes that she can use the power to not only show up her sisters, but also have some fun at the expense of men who wouldn’t give her the time of day previously. What follows is entertaining, nearly slapstick comedy: the suitors of Norah’s sisters, and her mother, fall all over themselves to take Norah out to dinner. She acquiesces, and proceeds to make the evening a misery for the men who are so obsessed with appearances. I imagine I must really be an odd kind of creature, because I am not at all sure that it is not vulgar to make man, either in a general or a particular sense, the entire end and object of their existence, as so many women — who think themselves very far from vulgar — do. To be perfectly frank, I have no opinion whatever of man. Perhaps that is because he has none of me. Up to the present, he emphatically does not seem to have. But that only places me in the position of the onlooker who sees most of the game. I have seen some games, I give you my word for it. And I have come to the conclusion that man is useful, in his way; generous, sometimes; of service, occasionally, as a husband or father; and that, as a sort of courier, or Cook’s conductor, looking after the wants, ways, and whims of women, not altogether to be despised. But he is frightfully earthy, and has a most amazing conceit of himself. And why so many women — delightful, charming women — should spend their whole lives in endeavoring to please him, and swell with pride when they fancy they have succeeded in doing so — that is beyond my comprehension. This attitude — that women are more than simply the servants or objects of men — is rather enlightened considering the 1903 publication of the novel. Women’s suffrage in the U.K., Marsh’s home turf, would not be granted until 1928 (the U.S. was slightly better, ratifying the 19th amendment in 1920). Australia, however, had passed its women’s suffrage law in 1902, and Marsh might have been drawing on his perception, or conviction, that equality for women was inevitable. I can recommend The Magnetic Girl as one of Marsh’s more lighthearted works. Well, at least it’s on Google books! But I’ve really enjoyed the other Marshes you’ve reviewed. I appreciate the sentiment, but my God, this is a horrible sentence. I hope the whole book isn’t written like that and this is just a device to show the structure of Norah’s thoughts.